The United States has labelled the Myanmar military operation against the Rohingya population “ethnic cleansing”, and threatened targeted sanctions against those responsible for what it described as “horrendous atrocities”. The world’s second-largest economy raised its hand this week to help halt the ongoing ethnic cleansing in Myanmar. But it’s not just altruism: China has an eye on ensuring stability for its hefty investments in the region. Crowded into sprawling camps of polythene sheeting, around a million people who have sought safety in Bangladesh amid violence in Myanmar’s Rakhine state are now facing a future of uncertainty and need. Myanmar’s de facto leader Aung San Suu Kyi was awarded the Nobel Peace Prize in 1991 in part for “striving” to attain “ethnic conciliation by peaceful means”. Pope Francis will meet the head of Myanmar’s army and Rohingya refugees in Bangladesh, both late additions to a tour of the two countries next week. Myanmar’s central bank has backed off from a demand that the country’s private banks clear most of their loan books by January, averting a cliff-edge scenario that some bankers warned could have destabilized the financial system. The Union government is seeking Pyidaungsu Hluttaw’s approval to sign the ASEAN Framework Agreement for the Facilitation of Cross-Border Transport of Passengers by Road Vehicles. MYANMAR plans to improve food safety in a bid to boost agricultural exports and extract more value from a sector that accounts for 38 per cent of the country’s gross domestic product. Cambodia and Myanmar have signed a memorandum of understanding to promote two of the greatest Buddhist sites in Southeast Asia as tourist destinations, the Khmer Times reported. Jotun, a privately-owned Norwegian paint maker, has opened a K14 billion factory in Bago Region. Located in the Bago Foreign Industrial Zone, the 4-hectare plant will provide paint manufacturing jobs for more than 60 employees. This week, India and Myanmar kicked off a new military exercise between them that focuses on peacekeeping operations. The drills once again placed the spotlight on a budding defense relationship between the two neighboring states as part of their broader foreign policy objectives. Painter Kay Moe Ko predicts a twisted mass of high rises and flyovers. Kyi Hlaing Aung sees ocean levels as high as Yangon’s power lines. For artist Htan Kyaw Htay, the future looks like a grid of boxes, each containing a silhouette of migrants walking with their burdens. The Construction and Housing Development Bank (CHDB) is planning to increase the loan period for low-cost and affordable housings from 15 to 20 years, said its managing director Myint Myint Mu. 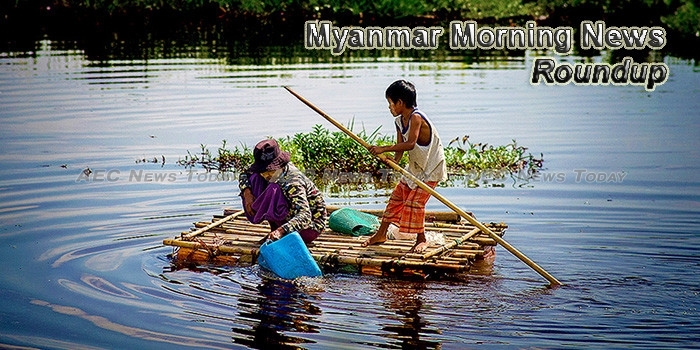 DESPITE GREATER downside risks including religious strife in Rakhine State and a hike in commodity prices, it is a perfect time for Myanmar to start its second wave of reforms, according to the International Monetary Fund.